It's difficult to come up with a summary for Bats of the Republic; the 2016 Tournament of Books shortlist pick is so darned ambitious. In a blend of science fiction, historical fiction and more than a dash of the Wild West, Dodson weaves a pair of dramatic love stories. Though they take place 300 years apart, they are connected by Texas landscape, powerful bloodlines and the contents of a mysterious letter. As those of you who follow book buzz likely already know, the format of Dodson's solo debut is anything but traditional. First, the good. That whole "illuminated" thing on the cover? 100% accurate. This is one of the most physically beautiful books I've ever had the pleasure of reading. There are sketches, photographs, family trees, diagrams and books within books. Pages fold out and become maps, and, right in the back, there's a mysterious envelope with "DO NOT OPEN" scrawled across the front. And there's an actual letter in it! (Library readers, don't fret; if your copy of the letter is missing, Dodson includes a URL you can use to access it.) I loved turning each page and not knowing what I would be in for. While Dodson isn't the first to have gone the dossier-as-novel route, his take on it is definitely most aesthetically-pleasing I've come across. Unfortunately, I don't think the story lived up to the concept. I am willing to admit that some of the historical or mythological references probably went right over my head. Even so, it felt too cluttered. Without getting into spoiler-y territory, Dodson packs in cowboys and Indians, dystopia, occult alchemy, serial killers, political succession and intrigue, and zoology. Got all that? Yeah, me neither. If we had gotten, say, three of those things, I think this would have been a much more cohesive story. As it stands, I got way too lost trying to link all of the details together. I'm not opposed to a complex story (for one I loved, see The Shore by Sara Taylor), but it has to come together. Unfortunately, Bats never fully did for me. I also think that the number of things going on got in the way of me connecting with any of the characters. Some of this is intentional, I think (you know, rigidly-surveilled and regulated futuristic society and all that), but I would have liked some more humanity along with my bells and whistles. If you're looking for an absolute treat for the eyes and don't mind the story playing second fiddle, Bats of the Republic is a worthy choice. If the story gels more for you than it did for me, even better—please come back and tell me all about it! 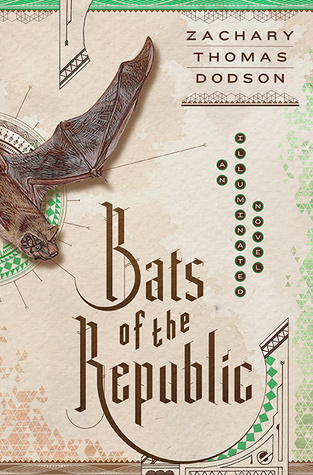 Have you read Bats of the Republic? Did you get more out of it than I did? Talk to me!